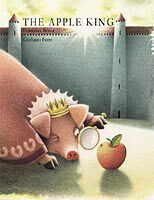 SUMMARY: The Apple King is a simple FREE word guessing game. This is an online, FREEWARE educational software, a spelling game, an educational game for kids. The Apple King is a fun, friendly online hangman game for kids. Hangman games are a great way for students to practice their spelling words. The software helps children learn, and practice the language is also excellent for adults. It helps in learning letters and words, and thus indirectly help the learning of reading. This program teaches you to read while playing. The record was born: March 30, 2018. Description: Once there was a king who owned a fine apple tree that no one else in the kingdom was allowed to touch. One day something terrible happens-worms invade all the apples on the tree! The king is outraged. He tries everything-bribes, force of arms, magic-to drive the worms away. But the worms refuse to leave. They are there for a purpose, as the king will soon find out. In a story that's as sweet and satisfying as a delicious red apple, a selfish king discovers that pleasure shared is pleasure multiplied. Below you can see what is the difference between Demo and Full Version where the registration is necessary. The table shows the specific features of the game which can easily be compared. Both versions are free, uses sounds, and the counts your Golden Apples. The Full Version contains much more words, and there are many great features available. (**) Works with most modern browsers.